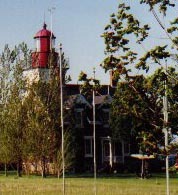 Dunkirk Lighthouse is located slightly west of Dunkirk, New York. The lighthouse is part of a museum and is only open during museum hours. There is a slight charge to enter the site. Directions: Take the Dunkrk exit off of I-90 (New York State Thwy.). Proceed into Dunkirk on NY 60 (Bennett St.) Turn left on Lake Shore Drive, which is also NY 5. After 1 mile, turn right on Point Drive North. Proceed to the end of Gratiot Point and the museum will be on the right (after the road curves to the left). Since we were not able to access the lighthouse when we visited, we rate it on a scale of 1 to 5 stars as 2.5 stars. It may be better if you go inside. Return to Lighthouses of Lake Erie - U.S.